Allow yourself to be charmed by the magical old town, the paradisiacal beaches and the lively streets. The Venetian and Roman ruins of Zadar show the rich past of this Dalmatian city. This Adriatic city offers not only natural, historical and religious wonders, but also a first class gastronomy. Explore beautiful beaches and romantic bays with turquoise waters while being surrounded by an idyllic natural environment. Enjoy Mediterranean comforts in its quirky winding streets, the medieval quarter transmits a special charm. Lagoon 450 from 2018 available from Rogoznica. Discovering Croatia by boat is by far the best way to explore this Eastern European country’s 2000 km long coastline and seeing as there are more than a thousand of them, at least attempt to visit some of its incredibly heavenly islands. 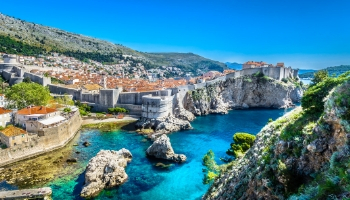 From the medieval inland capital, Zagreb, to the chief seaside city, Dubrovnik, Croatia is glorious from top to bottom. Whether you choose to start your boat rental in Croatia in the coastal region of Istria and make a round-trip south and back up, or remain in island paradise throughout your boat charter, you really can’t go wrong whatever the choice. The sailing season typically runs from May to September. 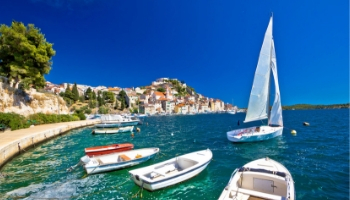 Summer is ideally the best time to sail with you boat rental in Croatia, with peak months, July and August, reeling in sunseekers in need of vitamin D and sea air. Spring features occasional showers with temperatures varying from 22°C to 28°C and summer temperatures can peak 30°C. Spring and Autumn can be great seasons for avoiding the mass tourism and finding more seclusion and retreat, albeit with cooler temperatures. During high season, the wind is usually force 3 - 4 blowing in a north-westerly direction. The list of attractions, water sports, party places, culture stops and beach locations are endless, but allow us to give you a brief idea. 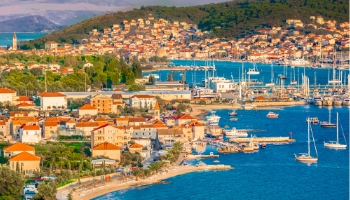 Harbour hotspots such as Split are rich in culture as it only takes a short stroll around the historic centre to see that you are walking amongst the remains of an ancient palace. Renting a boat in Split gives you access to many islands closeby, allowing you to experience the best of both worlds. There are many watersport and cave tour activities available, you need only walk along the dock to find the various stalls and companies. Rent a boat in Zadar and enjoy your time ashore discovering the Roman and Venetian Ruins in the old town, as well as the incredible colossal harmonica which is played by the ocean, not to mention the solar-panelled dance floor which lights up in the evening. Alternatively, dock your boat in the coastal city of Pula, where you can admire the ancient amphitheatre within just a few minutes’ walk. 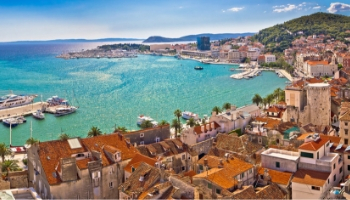 You’ll be pleased to hear that for boat rentals in Croatia, in Dubrovnik and also in Split, you can find direct flights to their airports, Dubrovnik (DBV) and Split (SPU). Pula Sirport (PUY) and Rijeka Airport (RJK) are smaller airports, yet still have direct flights to other locations in Europe. You can also find direct flights to the mainland capital Zagreb (ZAG) and catch a regional flight to a smaller, more local airport. Train services are networked more inland as opposed to along the coast, with boat and bus being the main means of transport elsewhere.